Having the same name as another artist is never easy. In a field in which establishing an idiosyncratic vision is crucial, the prospect of having your artwork, personal statements, CV, or bio mistaken for another’s is vexing. This duplicity is made even more complicated and public through the expansive yet undiscerning World Wide Web, where names are easily searchable but identity is always indeterminate. A friend, having done some research on your practice might remark, I had no idea you had a Master’s degree from Princeton, or I didn’t realize you have shown so extensively in Europe. Eliciting the slightly envious reply that unfortunately, your friend had confused you with someone else. Marcy Sue Freedman and Marcy B. Freedman have never met, but because they share the same name, they have known about each other for as long as they have been exhibiting. They have casually followed the progress of each other’s work and careers through misdirected searches, mistakes by friends and colleagues, and just plain curiosity. This exhibition titled Marcy Freedman is their meeting point. It brings together the studio work of these two artists along with their social practices as a way of sharing, integrating and complicating aesthetic practices and personal histories. For Marcy Freedman, Marcy Sue Freedman, an artist and cultural producer, will present two delicate works in the gallery: a photograph composed from sculptures created by pouring liquid candy, and a small sculpture conveying a sense of lightness and ephemerality. She will also present two new works by two artists, Peter Coffin and Xylor Jane, created through a supplemental New York City edition of Drawing In Residence. Drawing In Residence is a program Marcy has produced since 1999, in which she invites an artist to her home or an auxiliary site to collaborate on a drawing with her in exchange for a home cooked meal. All the drawings are then archived and exhibited as part of the Drawing In Residence collection. Marcy B. Freedman is a performance artist, video artist, art historian and teacher. She will present 2 video works in the gallery dealing with the communication and understanding of contemporary art. Then at the gallery on Saturday, February, 17, 2007, at 3:00pm, Marcy B. Freedman will give a presentation on the DrawingInResidence program, relating the work of the invited artists to Marcy Sue Freedman’s work, her own history and art history. “I met Marcy Freedman when I was in Art school in San Francisco. We were both attending a graduate course taught by a famous artist who was a visiting faculty member that year. We hung out one night after class and bonded over a couple of drinks. We talked about art, our class together and a project that Marcy had just begun: Drawing in Residence. For this program, Marcy would invite an artist to create a drawing in exchange for a home cooked meal. Later that night we went to a rave. “I met Marcy Freedman while working at Art in General. She had submitted an application to the commissions program. After learning that her proposal had not been selected, she decided to attend an informal meeting to speak with a staff member. I was the staff member who spoke with Marcy. We talked about her proposal and her other projects. 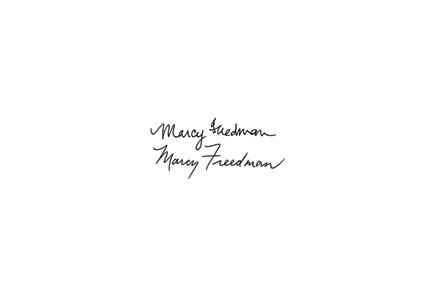 I mentioned that I knew another artist named Marcy Freedman. At the end of the meeting, she invited me to visit Peekskill, the town in which her studio is located and the site of a thriving art scene. Half a year later, I accepted her invitation. I came up to Peekskill to experience Dead of Winter, a project presented by The Hudson Valley Center for Contemporary Art (HVCCA). Marcy met me and and my friend at the Peekskill train station. She took us to the HVCCA museum to get information about Dead of Winter, then to an exhibition space above a theater for which she had curated a couple of projects, and finally to a commercial gallery where she occasionally shows her work. She then left us to tour the artworks, promising to meet us later for dinner.